Space Puzzle is a 12-sided atmospheric puzzle, made from pentagonal puzzle parts. It comes in 6 coloured mats, each with 2 pentagonal puzzle parts. Is your brain flexible enough for this intergalactic brainbreaker? 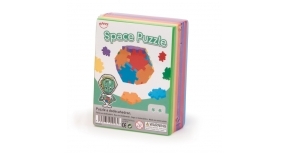 It is possible to combine the Space Puzzle with the separately sold Happy Cube puzzles. With the puzzle pieces in the 6 coloured mats, you can build a 12 sided atmospheric puzzle.